With organic farming being the buzzword these days and indignant paranoia surrounding the food we consume, most people have begun to feel the need to try out their green thumb. Assisting them on this deceptively easy course is Yogita Mehra, ably backed by her husband Karan Manral, through their venture, Green Essentials that works as a knowledge centre, store and nursery, all rolled in one. Deepa George meets up with them to get the dirt on how it’s done. There is no thing as a green thumb!” exclaims Yogita as I try and find a reason behind her passion. 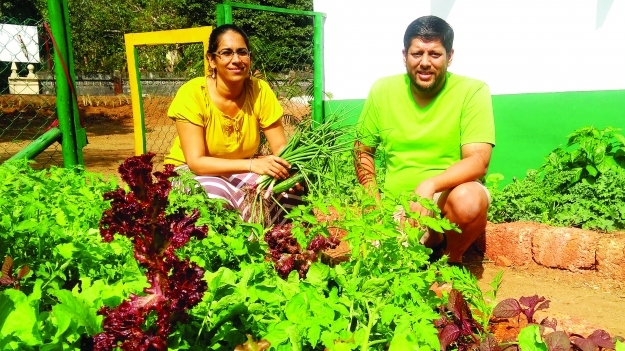 She quickly adds, “It is all about observing, empathising and obstinately persisting.” That makes sense and perhaps is inspiration enough for anyone to give growing your own vegetables a chance. City slickers from Mumbai, Yogita doesn’t make any claims of ever harbouring dreams of being an organic farmer or even ever really growing anything as a child. Her draw towards gardening and starting her own venture too, in a sense grew organically. Looking at the garden adjacent to the newly re-opened Green Essentials center in Socorro, one can take her ‘city slicker’ claim with a pinch of salt. In the 60 sq mt garden, she has grown corn, that looks like the magical tree from ‘Jack in the Beanstalk’! She also grows brinjal, mustards, lettuce, beans, a variety of herbs, capsicum, spinach, onion, fennel, radish and more! Like a proud mum, Yogita says, “This was planted on November 23rd and we had our first harvest ready for our New Year’s eve party.” Trying to make a sense of it, she has been weighing her produce and generously distributes it to all who drop by. Taking us back to where it started, Yogita shares, “I worked at The Energy and Resources Institute (TERI) in Goa for eight years and as is with any corporate job, soon realised that my direct impact with the environment was minimal.” Her inclination to this field was triggered by her earnestly trying to implement eco friendly practises at home, beginning with composting. Once she started using the compost pots by Daily Dump (an organisation that focuses on home composting units), she realised how simple it was to turn waste into manure. Her “partner in creating a good ecosystem” is her husband Karan Manral who brings his marketing expertise to the business. As Yogita declares, “My wildest ideas are given wings, with his genuine incredulity in responding with a ‘Why not’?” Currently, both of them are in the process of developing their plant nursery to include all types of fruit bearing trees.